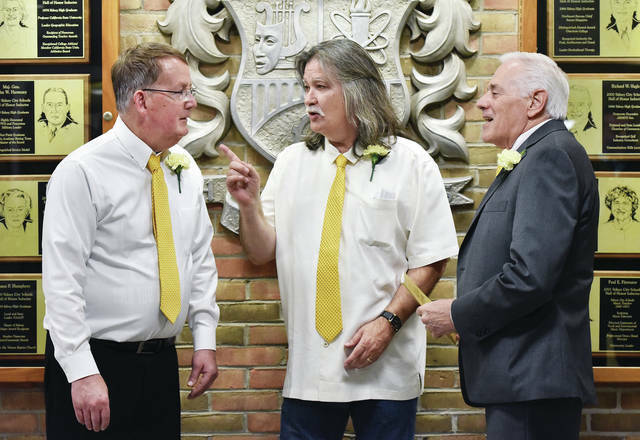 Sidney City Schools Hall of Honor 2019 inductees, left to right, Tom Clark, of Sidney, David Shadoan, of Vista, Calif., and Tim Bickel, of Sidney, attend their induction ceremony at Sidney High School on Saturday, April 13. Clark lead the way in establishing the Opportunity School, an alternative education pathway to help Shelby County’s at-risk students graduate and find jobs. Clark also was a successful SHS basketball coach. Shadoan co-owns a very successful sound rental company that gained fame working with Pink Floyd. Shadoan was inducted into the Audio Engineering Society Hall of Fame in 2012. Bickel was the principal of Parkwood and Port Jefferson Elementary schools in 1975 then Emerson Elementary for 10 years. In 1986 Bickel became curriculum director for 20 years until he retired. A fourth inductee, Taylor Stayton, was unable to attend the ceremony due to his opera tour in Norway.